A 4 litre/quart, 6 litre/quart (the most popular size) or 9.5 litre/10 quart capacity, 15 psi DUAL pressure, European-designed, stylish and safe new generation pressure cooker that is extremely easy to use. Made of 18/10 stainless steel with a mirror finish, not aluminum, the Fagor Futuro pressure cooker is strong, high-quality cookware. 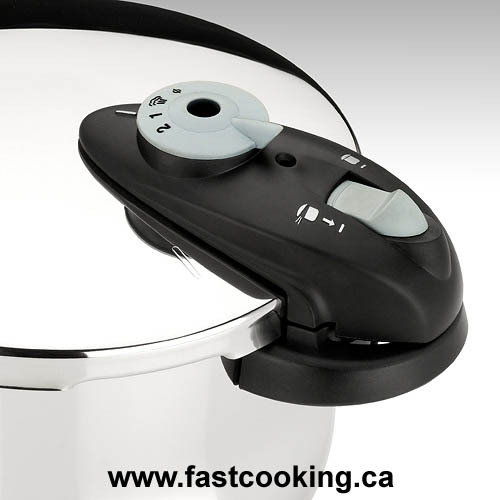 One of the fastest pressure cookers on the market. Made in Spain not China. 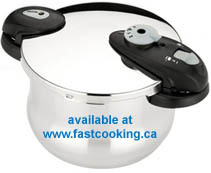 Futuro pressure cooker operates at 15 pounds (psi) pressure on its High pressure setting. Dual pressure with High and Low pressure settings. 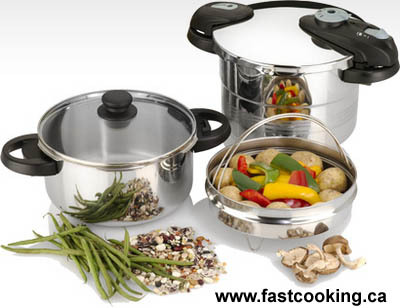 Constructed of heavy gauge, polished 18/10 stainless steel for worry free pressure-cooking. Does not have a non-stick coating. Perfluoroctanoic acid (PFOA) which is used to manufacture non-stick coatings on cookware has been associated with serious long-term health problems. Short side handles that save space. No-hassle self locking handle (photo). Quadruple safety mechanisms: a spring-operated pressure control valve, a safety lock on the handle that prevents accidental opening while under pressure, plus two independent over-pressure release mechanisms. UL-Listed pressure cooker for safety. Safe on all domestic cooking surfaces: electric, gas, halogen, ceramic and induction. Visual pressure indicator shows when the pressure cooker is under pressure. Tri-ply impact bonded and encapsulated diffuser base. This ensures excellent heat conductivity for rapid, even pressure-cooking. The stainless steel steamer basket doubles as a food grater. The Fagor Futuro Set includes a 6 litre Futuro, 4 litre Futuro, one pressure lid that fits both sizes, one tempered glass lid, steamer basket, trivet, user's manual and recipe book.